Please forgive the lumpiness. This yarn has a lot of body and wants to do what it wants to do. I will beat it into submission with a good blocking. It’s wonderful to be onto the body yarn of this. It’s so slippery and soft. Arm stitches are on lengths of string, waist shaping is about to begin, and mindless stockinette is here just in time for a little T commute this evening. Tonight at 6:30 on the Cambridge (MA) Common, near Harvard Sq., the Lazy Red-Liners, a Ravelry knitting group, are meeting up. The Bohus and I will be there. Non-Ravelry members are more than welcome. Bring your fiber art of choice, something cool to drink, and something to sit on. See you there! So beautiful, so, so beautiful! Have you considered working up a kit or that simply more effort than it’s worth? that is so pretty!!!! i may have to break down and do one of these – the more i see, the more i love them! PS, finished norwegian hat with the custom dyed, it’s sooooooo perfect. Can’t wait to knit more wee things! I totally forgot to say that the most upsetting part about not being prepared for a meet is that I will not get to pet the bohus in person! It’s beautiful. This is just so beautiful, I can’t stop staring at the pictures! Can’t wait to see more of it! Gorgeous! Wish I could make it to the meet up but alas, being across the country it would take an miraculous act to get me there. Have fun! This turned out stunning! It must be so fun to plan both the yarn making and sweater making together. I’m actually in town tonight and would love to join you all but I have some late night work to do. sigh. Another time for sure. Beautiful! I may have to make a bohus now. It’s is just gorgeous. I love the colors and the way you’ve arranged them. The colors are drop-dead gorgeous.. simply stunning! You never seem to stop impressing me and others.. Beautiful. Wow, that sweater is quite possibly more beautiful than the original Bohus sweaters. 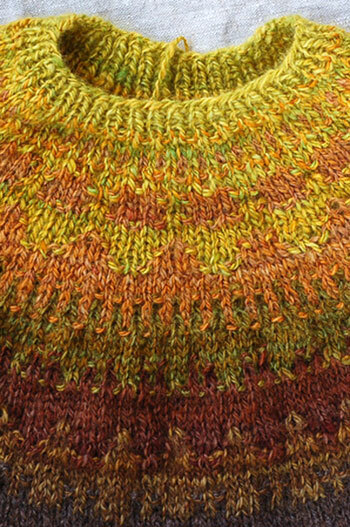 I really like your interpretation of the design with your handspun yarn and colors. This is inspiration for me to become a better spinner. oh adrian!!! i’m clapping loudly and grinning from ear to ear. 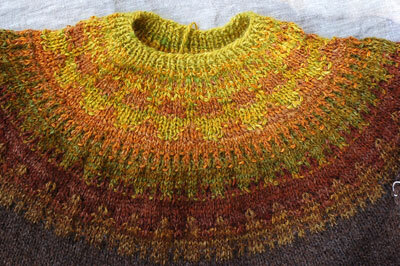 you’ve inspired me yet again, as i’ve been fantasizing knitting a handspun bohus cardigan. Inspirational. If I lived closer I might come to the meet up tonight with the sole purpose of purloining said sweater, or at least gawking in person. Just beautiful…the colors are great. Wow, Adrian – that’s SPECTACULAR!!! really really lovely. Too late for me to come, I find out, but soak up the admiration of everyone ther and know I would be part of the hue and cry. I just love the colors on that sweater. I love to buy from Hello because the colors are ones that I would never think to put together myself and then when I see them, I just can’t imagine them looking better. Wow. Those colors are really, really amazing. Are Bohus sweaters typically knit top-down? I’ve always associated yoked sweaters with bottom-up construction, but then I’m definitely a yoked sweater novice. oh how beautiful. i love yoke sweaters and your’s is so lovely. great autumnal colour choice. wish i could go to a knitter’s meet up. Have I mentioned how excited I am about the Fiber Club? That I set a reminder in my calendar? That I giggled when I clicked to pay? I am a long time lurker but am pledging to break my lurkey ways as I have a new blog and see how nice it is to have comments! I have knit several of your patterns, and I gotta say- I like your style! Anyway, love the yoke, it will be great this fall. where does one get a Bohus kit or pattern? The bohus is beautiful! I hope you enjoy the endless rounds of stockinette! A Ravelry red-line group! W00t! this yoke is stunning! i want to make this — I loved it on Yarn Harlot but these colours are even better — and I love the blend, in a project, of areas that need attention and provide interest, and areas that can be knit amid distractions and then are really soothing to work. Amazing colours! Love how they just float into each other. Is it hard to tell the different colours apart when knitting? that sounds like so much fun. wish i lived there. your yoke looks lovely! LOVE those colors and your knitting too!! Hey, off the wall question, are you the person who helped juju get her blog going? If so, I’m starting to ‘shop’…want to move away from livejournal, maybe to my own DOT com. It’s a new world for me, but the waters have been charted so I know it’s navigable…let me know if you still do that, general idea costs, etc? thanks! Gorgeous, gorgeous colors! You’re going to be all ready for fall. It’s so beautiful, Adrian! It just glows, yet is earthy. I love the colors and how they blend together. Wow, it looks amazing to me. The colors are just vibrant.